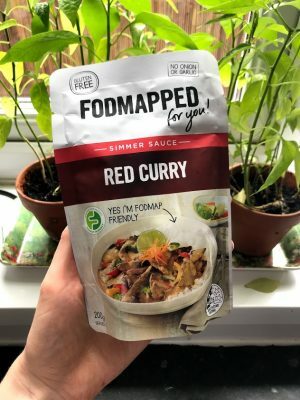 Since writing my initial Low FODMAP Favourites post, I’ve had the opportunity to try many more low FODMAP products, and find out more about the alternatives available. 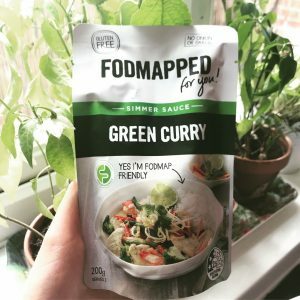 With the increasing awareness of the low FODMAP diet, there are now a number of new and exciting products available to buy from supermarkets, or from online FODMAP specialist shops. For example, read my review here of the Schar Low FODMAP Range which is now available in the majority of supermarkets. The favourites I’ve highlighted below consist of new products I’ve tried recently which have been either been gifted, or have become frequent additions to my shopping list. In this post, I’ve focused on more on quick, easy yet tummy-friendly meals. 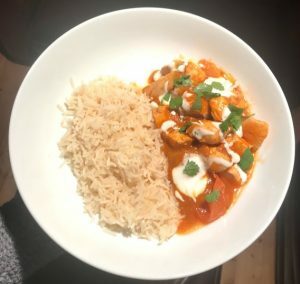 As a teacher, I find it hard to find the energy after a long day at work to cook a meal from scratch, so I’m so pleased that there are now many convenient foods from sauces, soups to pizza bases to save me time. Allowing me time to relax, go to yoga and most importantly, to bake! I’d seen these sauces online and I was really keen to try them. 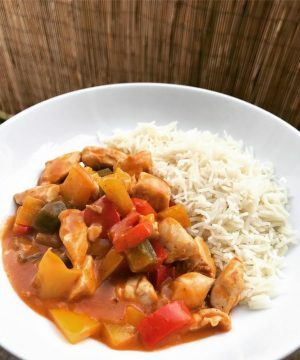 I was kindly sent the Red Curry simmer sauce first, for which I just added some chicken and mixed peppers, and served with rice. I was so impressed with this sauce, not only is it a really quick dinner to make, it tasted delicious. The sauces aren’t full of additives and endless ingredient lists like some shop-bought sauces, and they make following a low FODMAP diet so much easier. 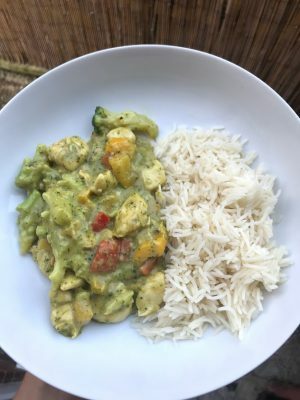 Having enjoyed the Red Curry sauce, I then picked up a Green Curry sauce at the Allergy and Free From Show back in July. This was, in my opinion, even tastier than the Red Curry sauce, and I served it with chicken, yellow and red pepper and broccoli. I can’t wait to try more of their sauces, let me know in the comments below of your personal favourites. 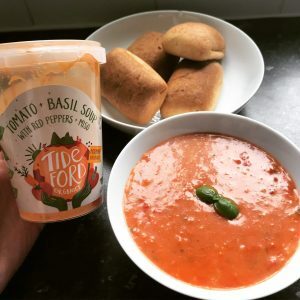 Earlier in the summer I was sent this low FODMAP soup to try, and it’s the only one of its kind I’ve ever come across. It’s now available on Ocado so it’s really easy to get hold of. I thought this would come in handy now that the cold weather is closing in! It was a really wholesome soup, with added rice, and a tasty tomato flavour. 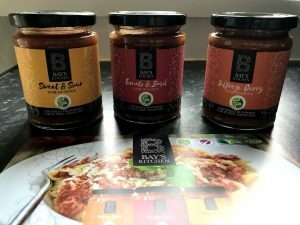 Another new addition to the low FODMAP ranges are these sauces by Bay’s Kitchen. They come in the three flavours shown below and make low FODMAP cooking that little bit easier, especially after a long day at work. My personal favourite was the sweet & sour as I haven’t had anything like it in a long time! 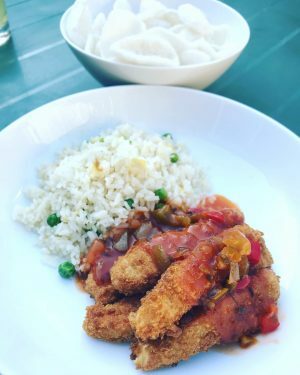 I poured it over some gluten free breaded chicken (below) for a tasty sweet and sour chicken with prawn crackers. A great chinese fakeaway! The tomato & basil and Jalfrezi sauce were good too, but I quite enjoy making my own! 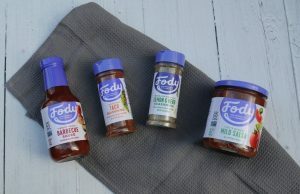 A week or so ago I was sent some FODY sauces which I was SO excited about. I’ve only ever heard great things about the barbecue sauce and it certainly lived up to its reputation. It’s smokey and tangy, and has so far been enjoyed with a rack of ribs, pizza, and this week I’m going to make Hunter’s chicken – because I can! I’ve also tried the taco seasoning and mild salsa in my fajita bowl featured below. The salsa is again something I haven’t had for such a long time – I can’t wait to make a big bowl of nachos over Christmas in front of a festive movie! 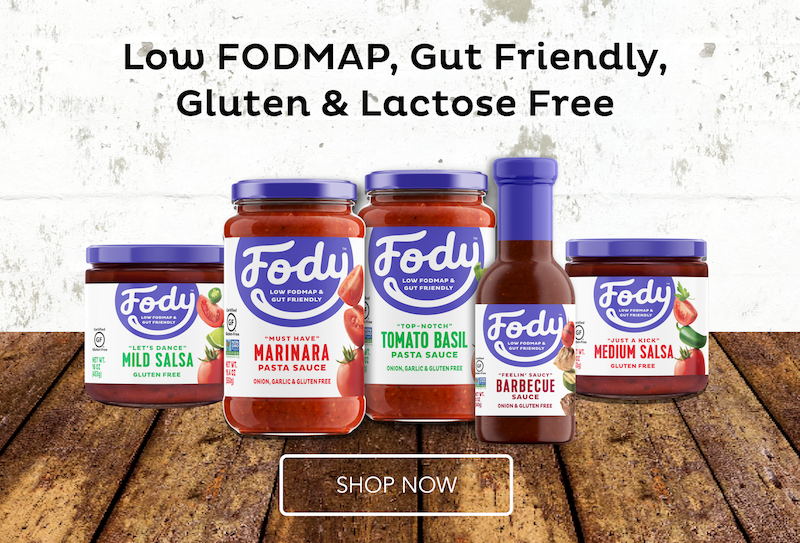 If you’d like to purchase any of these FODY products, I’m now an affiliate and receive commission, so I’d really appreciate it if you used this link. Despite being an affiliate this review is my honest opinion of the products. Ever since starting the low FODMAP diet I’m often asked what stock cubes I use, as all of the brands in the supermarket seem to contain onion, garlic or leek, or have mystery flavourings listed on the packet. However recently FODMarket sent me these three gluten free stock cubes to try in chicken, beef and vegetable flavour. I’ve since added them to so many recipes which I’ll be sharing soon, including my beef casserole, vegetable soup and beef rendang. They make home-cooking so much simpler knowing that all of the ingredients are FODMAP safe. Would it be a low FODMAP favourites post without featuring a pizza?! I love pizza, and the gluten free options are so good that I seem to have them at least once a fortnight. Especially since finding low FODMAP pepperoni in Sainsbury’s (see my original Low FODMAP Favourites post for details). 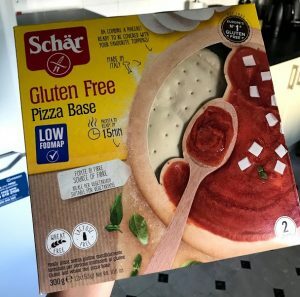 These low FODMAP certified pizza bases by Schar are a tasty, deep pan pizza which go nice and crisp in the oven. 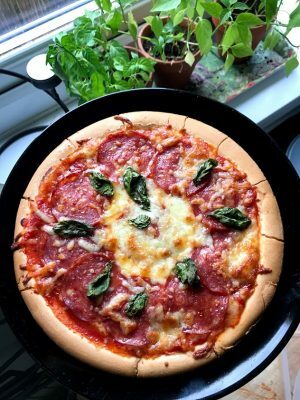 I make my own pizza sauce (garlic-infused oil, oregano, tomato passata and basil), top with mozzarella, pepperoni and basil – yum! 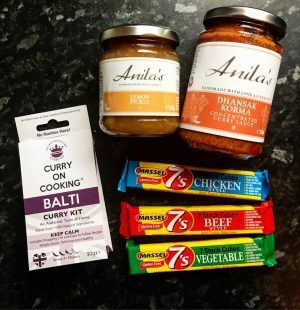 In my FODMarket delivery I was also sent a jar of Anila’s Dhansak Korma Curry Sauce which was authentic and delicious – exactly how a curry should taste, without any onion, garlic, dairy, nuts or gluten. I can’t wait to try the lemon pickle I was also sent – I’ll share what I pair it with over on Instagram soon! For anyone following my Instagram, you will know how much I love this beef! Not only is it gluten free, it also comes with a low FODMAP sweet chilli sauce (which is unheard of!) I love cooking these up with some fried peppers, beansprouts and rice noodles. 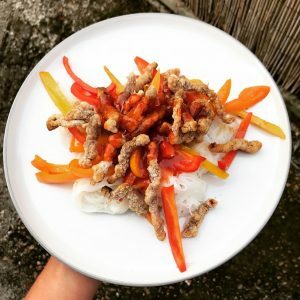 As I seem to be on a roll with convenience foods, I thought I’d mention the two Amy’s Kitchen products I often enjoy after a parents evening or late night at work. 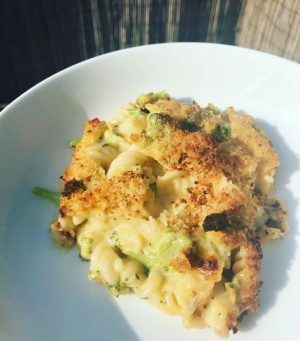 I either go for a rice mac and cheese or a broccoli and cheddar bake, both gluten, onion and garlic free. I find these super indulgent, but they do contain milk, so not suitable if you find lactose a particular trigger. I find the odd meal fine as long as I haven’t eaten lactose that particular day (avoiding FODMAP stacking). 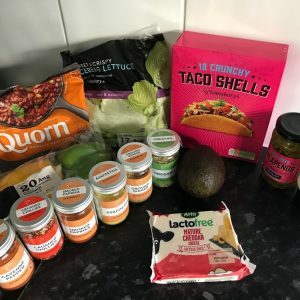 Last but not least is the new and improved Mexican range at Sainsbury’s which includes these crunchy gluten free taco shells. 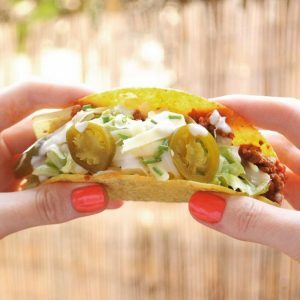 While these are naturally gluten free, it’s a cheaper option for a Mexican feast. 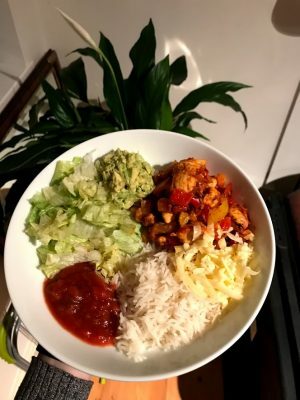 I used the chicken fajita recipe, swapping the chicken for Quorn mince and served them with lactose-free cheese, iceberg lettuce, a low FODMAP serving of avocado, a little sour cream and jalapenos. 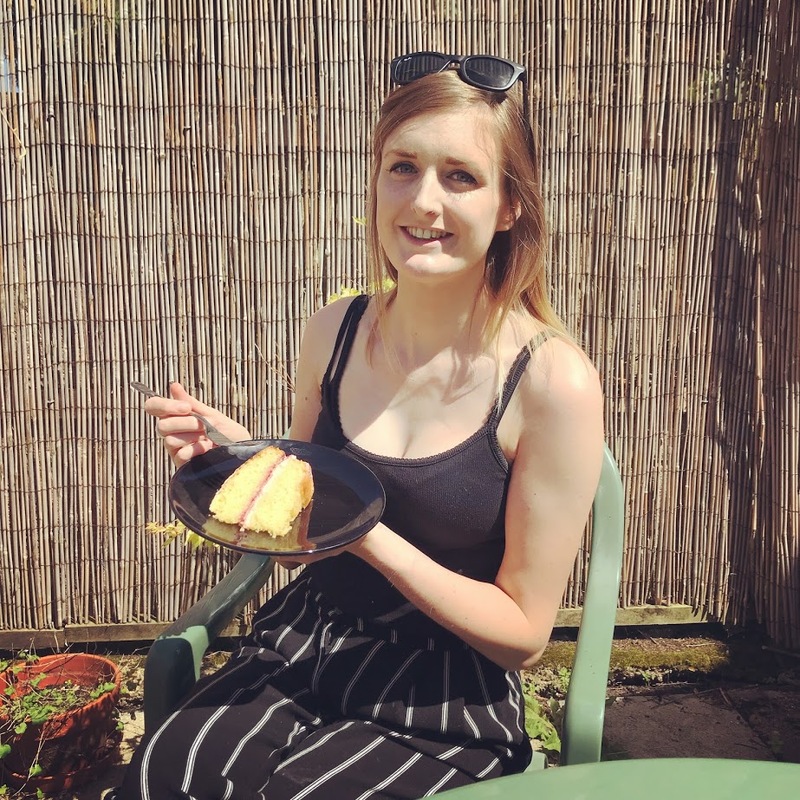 I hope you enjoyed reading this edition of my low FODMAP favourites. I’d love to hear if you’ve given any of these products a try and what you thought of them! Leave a comment below. If there’s any products you think I’ve missed or need to try, please do let me know.